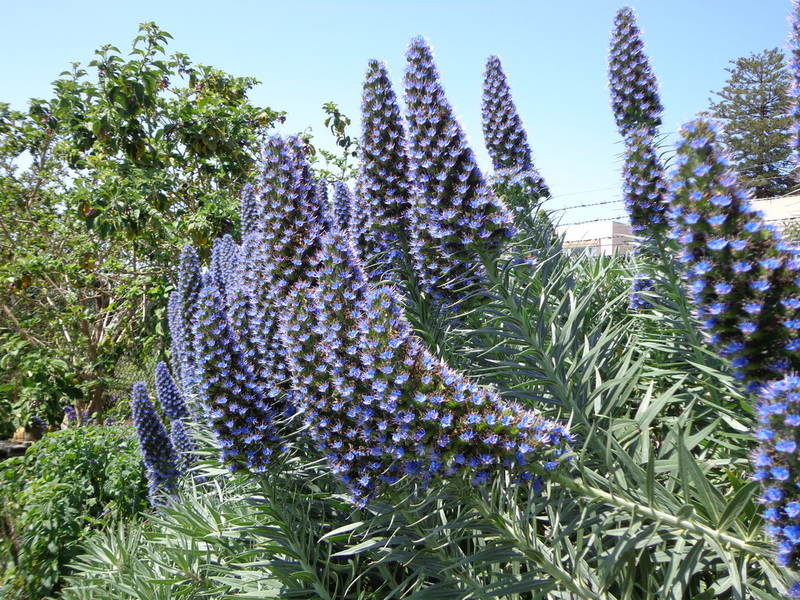 Description: Echium candicans is a large shrub 2-3m tall, 3-4m wide with hairy green, narrow leaves and showy bluish-purple flowers clustered in prominent vertical inflorescences 0.25-.04m in length. 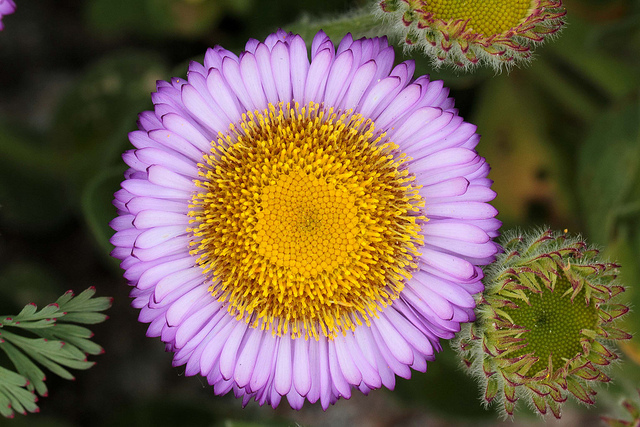 Plants with pink to pale blue flowers are called E. strictum. Flowering Season: Mid to late March through April. Resource for Bees: Pollen (blue) and nectar. 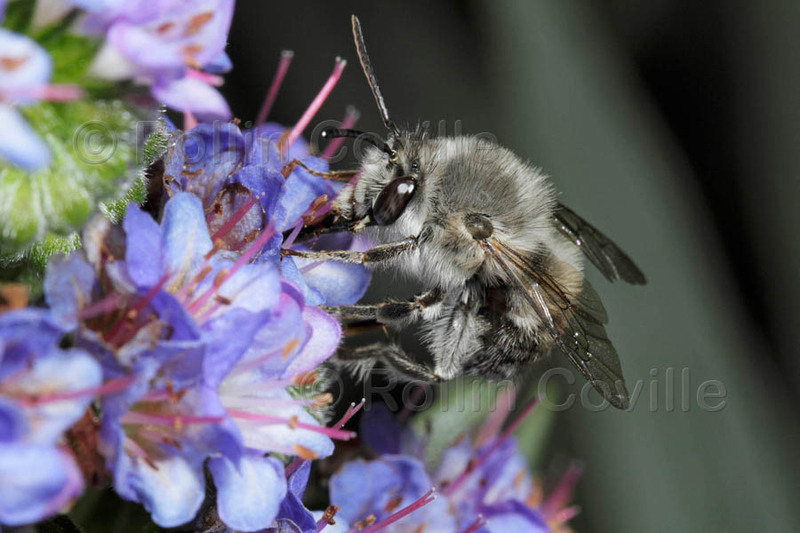 Most Frequent Bee Visitors: Bombus species, especially Bombus melanopygus, Habropoda depressa, and Osmia species. Bee Ecology and Behavior: Bees are attracted to some full-flowering individuals more than others, even if the plants are directly adjacent to each other. Gardening Tips: Under favorable growing conditions E. candicans spreads out to occupy considerable garden space, with abundant displays of flowers that are attractive to bee species until early afternoon. It is useful for bold effects against walls or on slopes. Prune occasionally to maintain the desired size of plant. Deadheading the tall inflorescences just as they are declining will result in a second flowering. Instead of vertical inflorescences, the new crop of flowers will fan out horizontally just below the cut stalk. 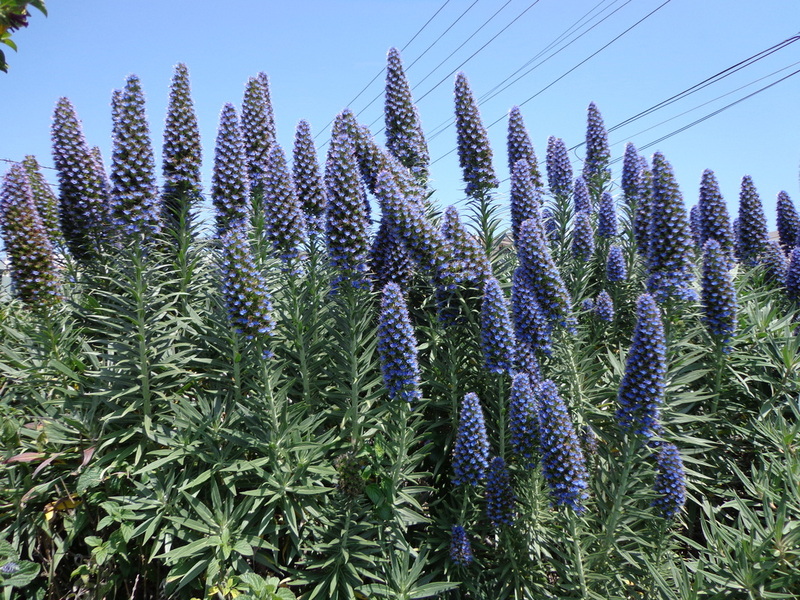 Notes: A related species, Echium plantagineum L., is a low spreading annual or biennial from Europe that produces pink buds with violet-blue tubular flowers that is very attractive to Bombus species and small bees in late spring—early summer. Flowering Season: Late winter to early spring. Most Frequent Bee Visitors: Bombus (especially B. melanopygus), Anthophora, Osmia, and Andrena species, Habropoda depressa, and honey bees. 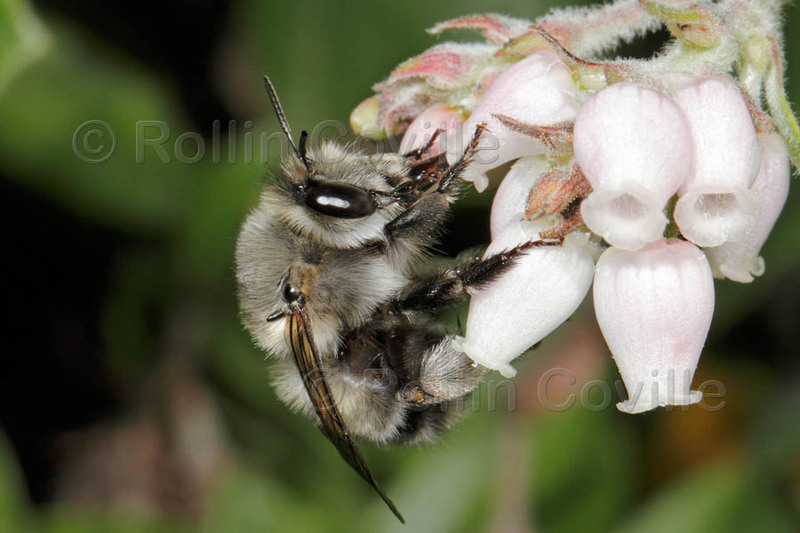 Bee Ecology and Behavior: Bees forage mostly upside down because the flowers are pendulous. Bombus and Osmia species visit and fly very quickly between flowers. Gardening Tips: Manzanitas like well-drained soils, but tolerate poor soil, e.g. rocky or sandy soils. Plants need water during the first season of growth. 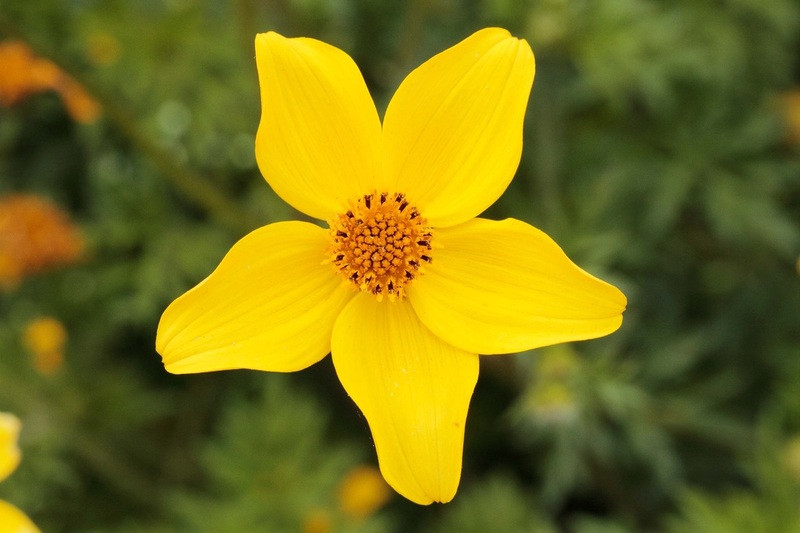 Description: Bidens is an herbaceous perennial up to 0.6m in height with bright yellow floral heads. It forms dense, compact patches when growing conditions are optimal. Flowering Season: Where climatic conditions are mild, for example in coastal California, flowering may last for the entire year. Resource for Bees: Pollen and nectar. Most Frequent Bee Visitors: Halictus, Lassioglssum, Megachile, and Osmia species, Melissodes robustior, and honey bees. 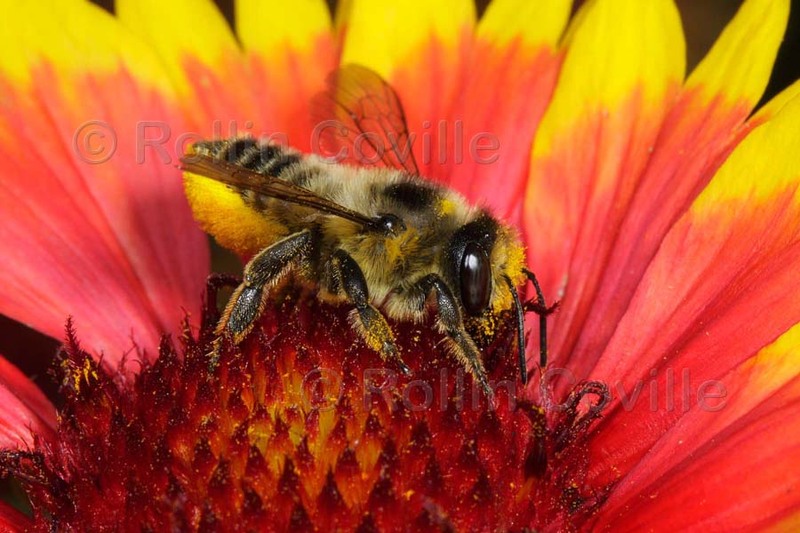 Bee Ecology and Behavior: Although Bidens can bloom vigorously throughout the year, bees are primarily attracted to it in late spring through most of summer, visiting less early and late in the growing season. 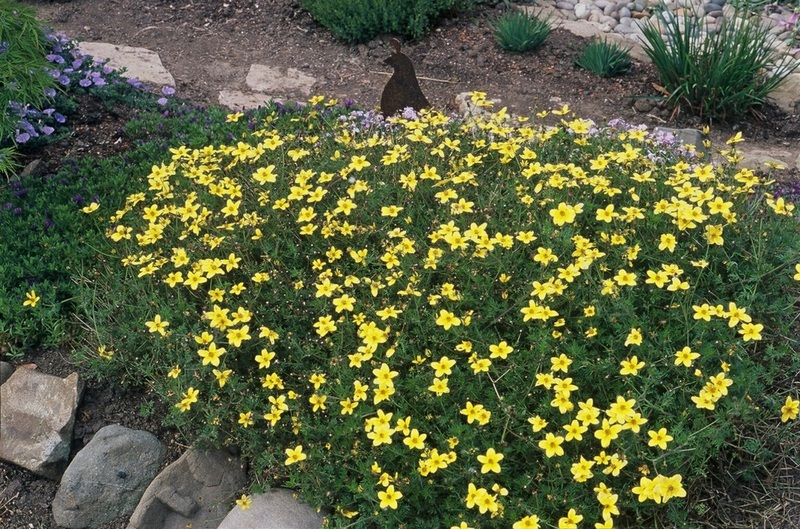 Gardening Tips: Bidens grows in a variety of garden soil types, including those with moderate amounts of clay, and does well in pots for short periods. Moderate summer watering, lots of sunlight, and occasional fertilizer promote healthy growth. Spreading plants need to be cut back occasionally, from which they rebound quickly. 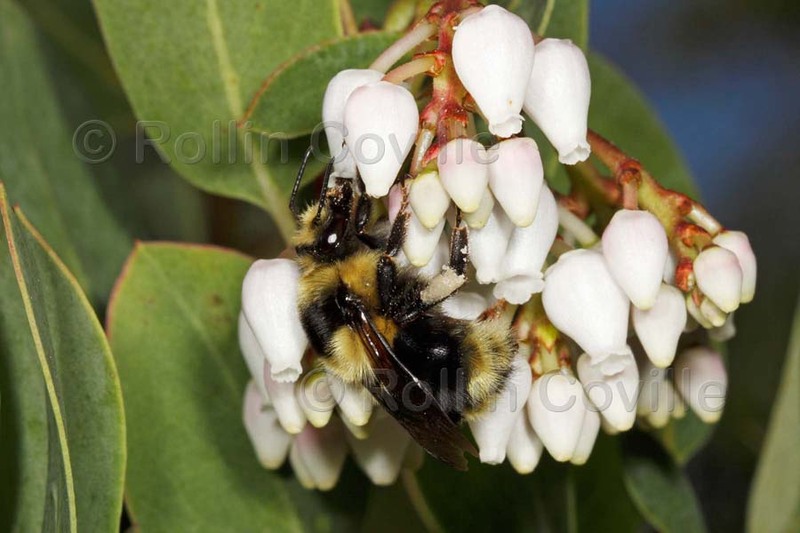 Select cultivars with the largest floral heads; avoid cultivars with small floral heads and low-growing border cultivars as they are poor bee attractors. 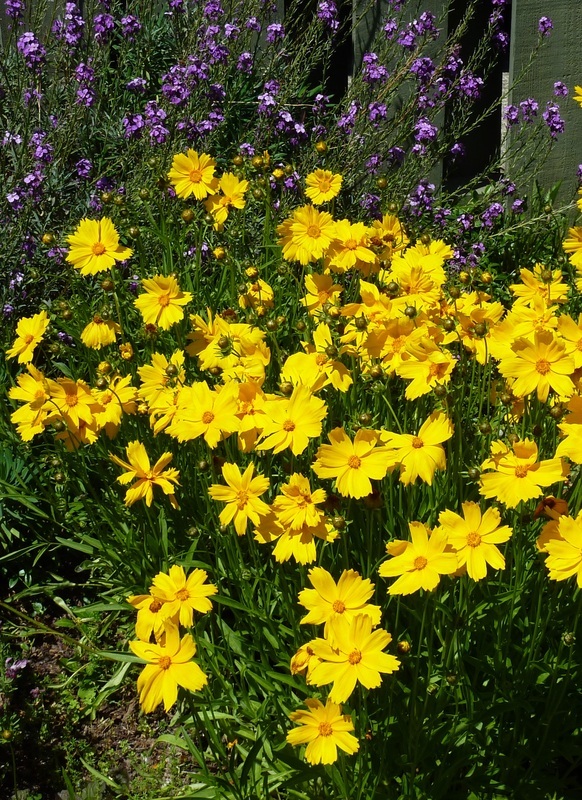 Description: Coreopsis grandiflora is a compact evergreen perennial, 0.5-0.8m in height and width when fully mature. This plant produces a dense patch of dark green leaves and numerous bright yellow floral heads, each 5-8cm in diameter, rising on slender stems from the leaf mass. Flowering Season: Mid-spring through summer and beyond with favorable climatic conditions. Most Frequent Bee Visitors: A wide variety of bee species. The most common are Agapostemon texanus and Halictus, Lasioglossum, Megachile, Melissodes, and Osmia species. Bee Ecology and Behavior: As with many Asteraceae, bees are easy to observe for several seconds at work on the flat open floral heads gathering pollen and nectar. Gardening Tips: Investing extra maintenance in this plant by regular watering and deadheading will produce a relatively long period of seasonal pollen and nectar for bees. It will grow in a variety of soils, but does best in well-drained loamy soils. It needs sun and regular moisture. Notes: Select C. grandiflora cultivars with the largest and simplest floral heads and avoid those with multiple whorls of ray flowers such as C. grandiflora 'Early Sunrise." Multiple whorls will often cover some or much of the pollen- and nectar-bearing disk flowers, making bee foraging more difficult. Non-native C. lanceolata L. and C. verticillata L. and their cultivars are two other bee attractive alternatives to C. grandiflora. Description: Encelia californica is a small woody shrub up to 1.2m in height with large 5cm diameter floral heads. 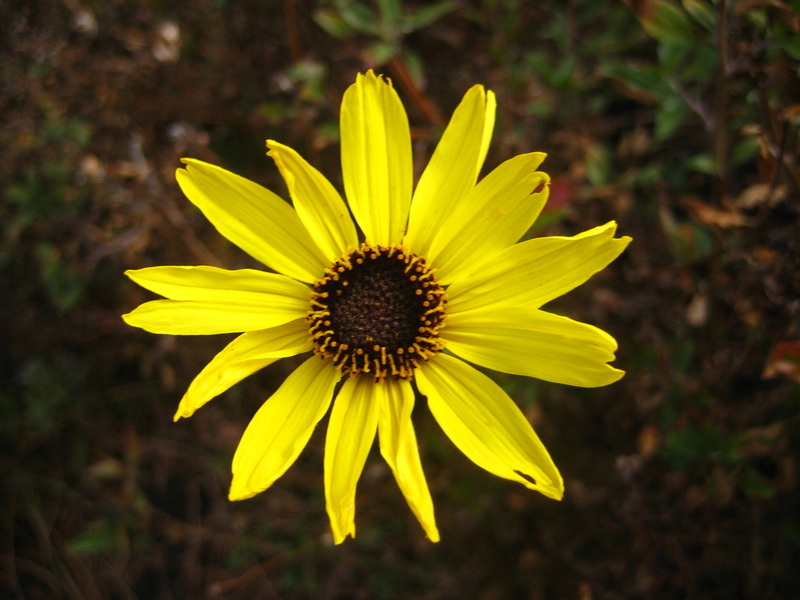 Ray flowers are bright yellow, disk flowers purplish brown. In full bloom, E. californica produces a showy display of floral heads. Flowering Season: Mostly spring flowering in the wild but in gardens of the San Francisco Bay Area it blooms year round. Most Frequent Bee Visitors: A wide variety of bee genera and species including honey bees, Agapostemon texanus, Bombus melanopygus, and Halictus, Megachile, Melissodes, and Osmia species. Svastra obliqua expurgata in the Central Valley. Bee Ecology and Behavior: Males of Melissodes robustior often fly rapidly around floral heads, occasionally knocking other bee species off of them, as part of their mating behavior. 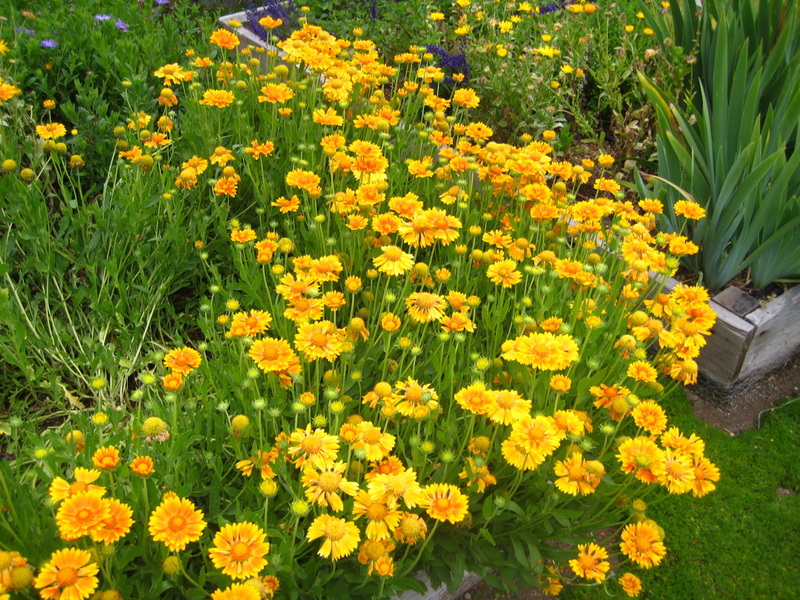 Gardening Tips: E. californica is fast-growing and does well in gardens once roots establish. It tolerates a variety of soil types and, in time, will become dense with bushy growth. It produces seedlings readily in some situations. Prune branches at the end of the year, especially dead sections. Water occasionally, fertilize annually and deadhead to prolong flowering. Notes: This is another of the native plant species that deserves more attention for bee habitat gardens. It blooms for long periods and bees like it, especially in the summer months. Floral heads also attract butterflies and several beneficial fly species. 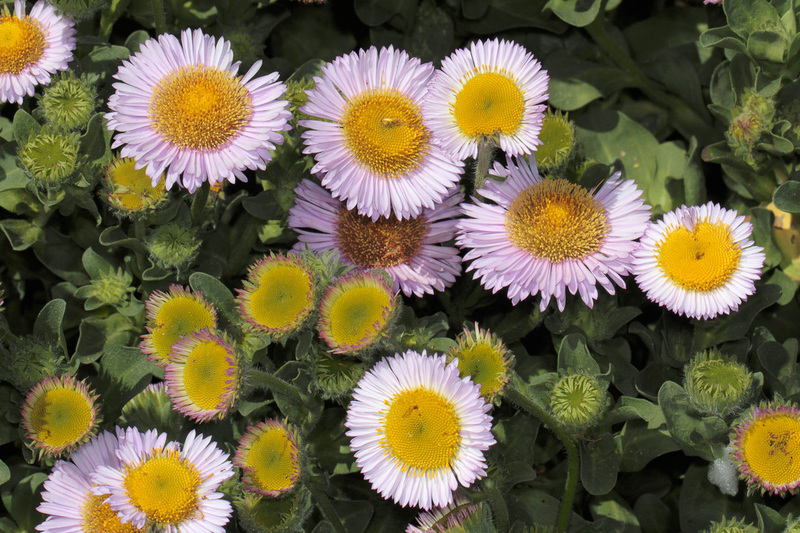 Description: Erigeron glaucus is a small evergreen plant 0.2m high by 0.3m wide. 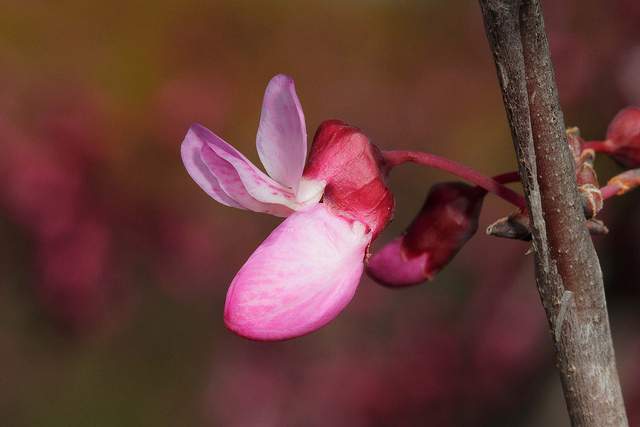 Showy ray flowers vary from white, pink, purple to blue. Disk flowers are yellow. Several cultivars are available, but 'Bountiful' and 'Wayne Roderick' are most attractive to bees. Flowering Season: Spring, summer and early fall. Most Frequent Bee Visitors: Halictus species, and especially Agapostemon texanus, Megachile species, and honey bees. Bee Ecology and Behavior: It is mostly attractive to bees during spring months. Megachild females shimmy on floral heads to secure pollen, which they groom into scopae on the undersides of their abdomens. Nectar foraging by all bees involves probing disk flowers with their mouthparts. Description: An erect, herbaceous perennial, the Blanket Flower is an often short-lived hybrid that grows in dense patches 0.4m to 1m high and produces colorful daisy-like floral heads 7-14cm in diameter. Floral head colors are variable depending on the cultivar. The most common color combination is mostly red with yellow tipped ray flowers. 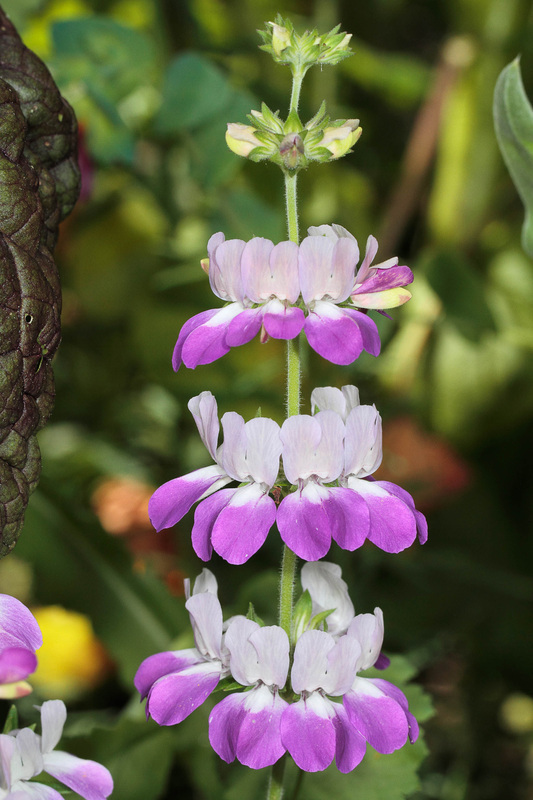 This plant is popular with gardeners throughout the state as they love the colors and long flowering season. Flowering Season: Late spring to early fall. Most Frequent Bee Visitors: Honey bees, Agapostemon texanus, and species of Halictus, Ceratina, Megachile, Melissodes. Svastra obliqua expurgata in the Central Valley. Bee Ecology and Behavior: Most bee species spend several seconds on a floral head foraging for pollen and/or nectar, and this provides an excellent opportunity for observing bees close up. Gardening Tips: It grows as a compact patch in full sun in a variety of soil types that are slightly moist and well-drained. It is easily grown from seeds and readily transplants from 10cm (4") containers to garden beds. Deadheading spent floral heads prolongs blooming. It needs moderate water during the growing season. A recently introduced cultivar (2004), G. 'Oranges and Lemons,' is now in widespread use throughout the state. Its showy yellow-orange floral heads attract mostly the same bee groups as G. ×grandiflora. Description: This annual California native typically produces tiers or whorls of flowers on short erect, delicate stems up to 0.5m in height. The square-shaped flowers are 2-lipped with the upper lip usually white and lower lip varying from pink to lavender in color. To McAuley (1996) "the circular arrangement of flowers in crowded tiers suggests successively flaring roof-lines of Chinese structures." Flowering Season: Spring to early summer. Most Frequent Bee Visitors: Bombus and Osmia species. 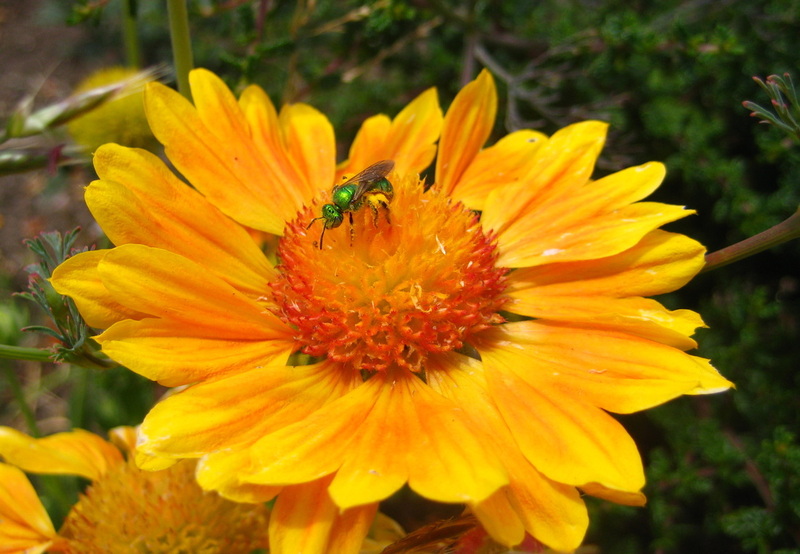 Bee Ecology and Behavior: Most bee-attractive plants occur in open, sunny areas. By contrast, Collinsia heterophylla is attractive to bees in shady locations. Bees push open upper and lower lips to reach the nectar and, in the process, are dusted with pollen on their undersides. Similar bee behavior can be observed in Linaria purpurea. In the related and very common garden relative, Snapdragon (Antirrhinum majus L.), only large bees such as Bombus and Xylcopa can open this sturdy tight-lipped flower. Gardening Tips: Chinese Houses are easy to cultivate. They are best planted in full or partial shade beneath larger shrubs or small trees. 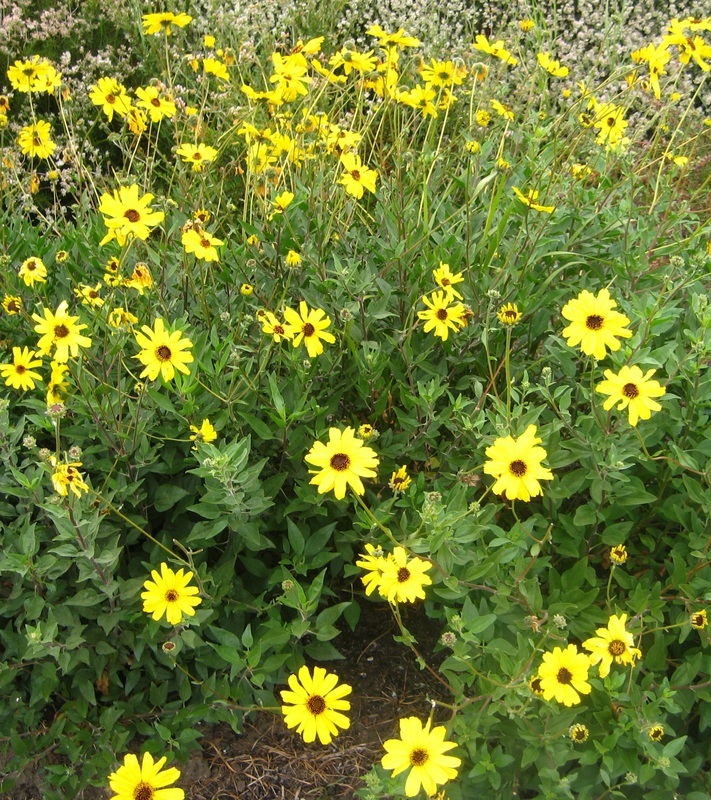 They do well in well-drained, sandy loam soil, and need occasional summer watering to prolong the flowering period. This species will satisfy gardeners who are searching for a shade-loving bee-attractive plant. 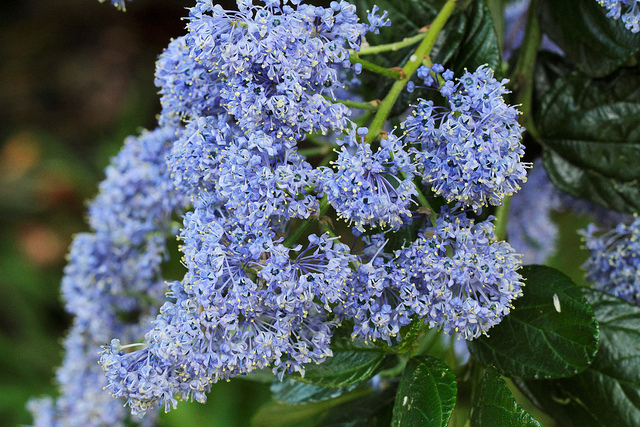 Description: Both cultivars are medium to large shrubs that produce small clusters of massive dark cobalt blue ('Dark Star') or dark indigo blue flowers ('Julia Phelps'). The small leaves of both cultivars are dark green. Flowering Season: Late March to late April. Most Frequent Bee Visitors: A wide variety of bee species visit the flowers of both cultivars. Bombus melanopygus, honey bees, Halictus, Andrena, Hylaeus, and occasional Osmia species, are the most consistent and frequent visitors. 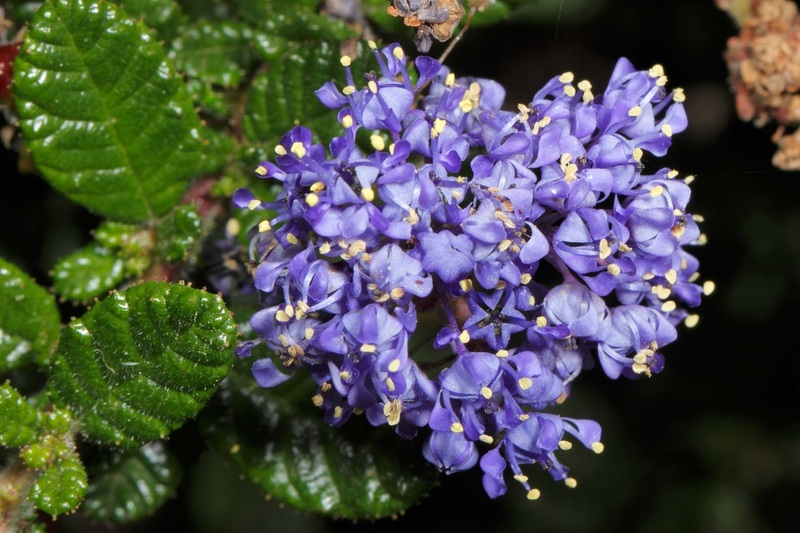 Bee Ecology and Behavior: As on Ceanothus 'Ray Hartman', most bees visit flowers quickly, gathering pollen from slightly extended anthers. Gardening Tips: Plant in well-drained soils. These cultivars are a must for bee habitat gardens, offering an excellent source of pollen for a wide variety of early springs. 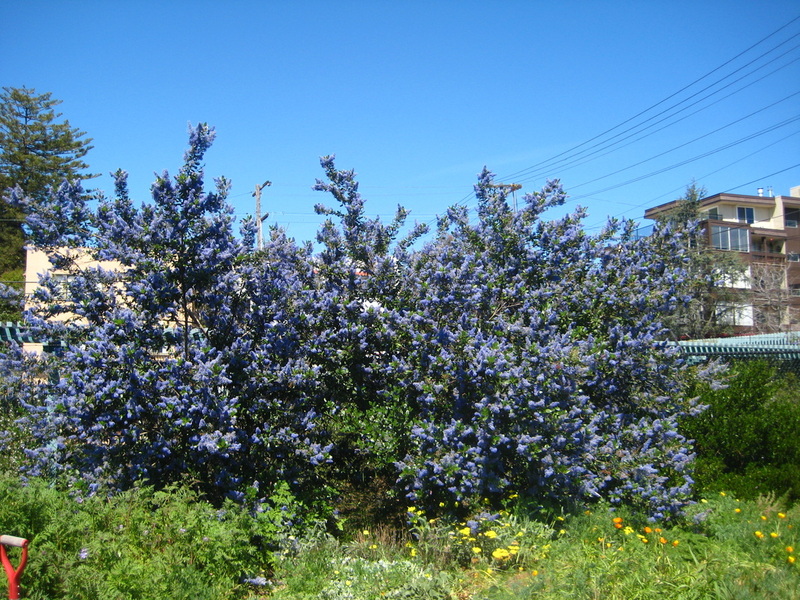 Description: The large shrub or tree, up to 7m, is a hybrid between Ceanothus arboreus and C. thyrsiflorus var. griseus. It produces clusters of spectacular sky-blue flowers in spring. Most Frequent Bee Visitors: A wide variety of bee species visit the flowers. Of the larger bees Bombus melanopygus, Habropoda depressa, Andrena species, and honey bees are the most common. Smaller bees include several Halictus, Hylaeus, and occasional Osmia species. Bee Ecology and Behavior: Most bees visit flowers quickly, gathering pollen from slightly extended anthers. Gardening Tips: Plants can be propagated from cuttings with some care and patience. Prune to keep the plant somewhat constrained as it has a tendency to spread out. Grows rapidly in a few years, offering massive quantities of pollen-rich flowers to a variety of spring bee visitors. 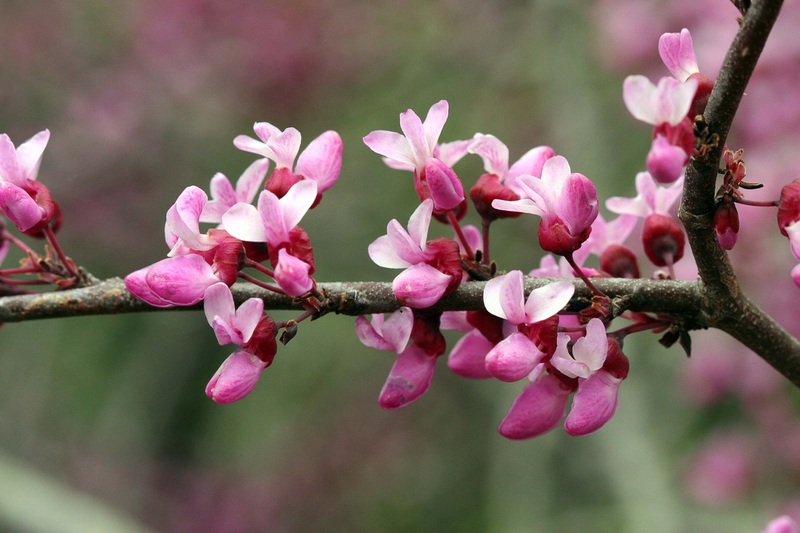 Description: Western redbud is a deciduous small tree or large shrub with profuse colorful pea blossoms, pink banner and rosy-red or magenta keel. Flowers occur on bare branches in spring before leaves, which pass through distinct color phases as they mature (Van Atta 2009). Flowering Season: Blooms for short period in spring. A second flowering of less intensity can occur in late summer or fall in some individuals. Resource for Bees: Nectar and pollen. Most Frequent Bee Visitors: Flowers attract large apid bees such as Habropoda depressa, and Bombus and Xylcocopa species. In some years, Osmia lignaria is highly attracted to the flowers, making it an important addition to agricultural bee habitats, as Osmia lignaria is is one of the few commercially important solitary bees that can be mass produced for pollination of some agricultural crops such as apples, cherries, and almonds. Some honey bees also visit C. occidentalis flowers. Bee Ecology and Behavior: Large bees are perfectly adapted to visit the pea flowers for nectar as they land on the keel and thrust their tongues into the base of the corolla in search of nectar. In doing so, pollen is dabbed on their undersides where much of it can be groomed and packed in their pollen transport structures. Small sweat bee females can push their heads and thoraces between the keel petals and scrape out pollen with their forelegs and mandibles. Leaves are also used by leaf-cutting bees (Megachilidae) for nesting materials. Gardening Tips: Does best in well-drained loamy soils in full sun. Will tolerate drought or infrequently watered soils.